Here I present to you a project log for my magnificent robot Arthur! 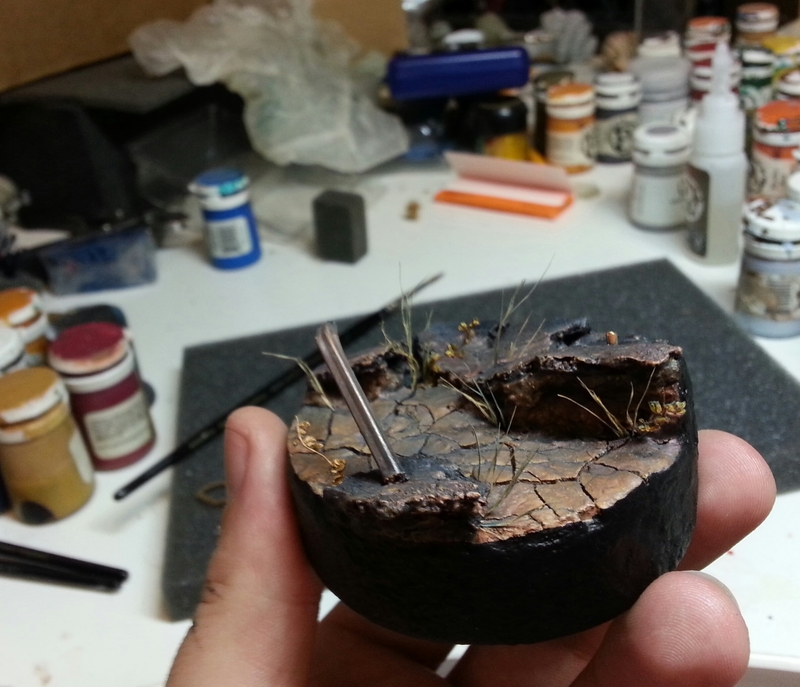 This article was originally published on the Massive Voodoo Blog and I’d like to take thing space to say thank you to my friend Roman Lappat for his inspiration and encouragement on my journey. What? You don’t know what I’m talking about!? Check out Massive Voodoo once you are done reading about Arthur. I like to start by sketching my idea. I use the outlines of some potential bases to set the proper scale for my drawings. This is very helpful for working out spacing and composition. My sketches are just rough ideas which are refined throughout the rest of the process. 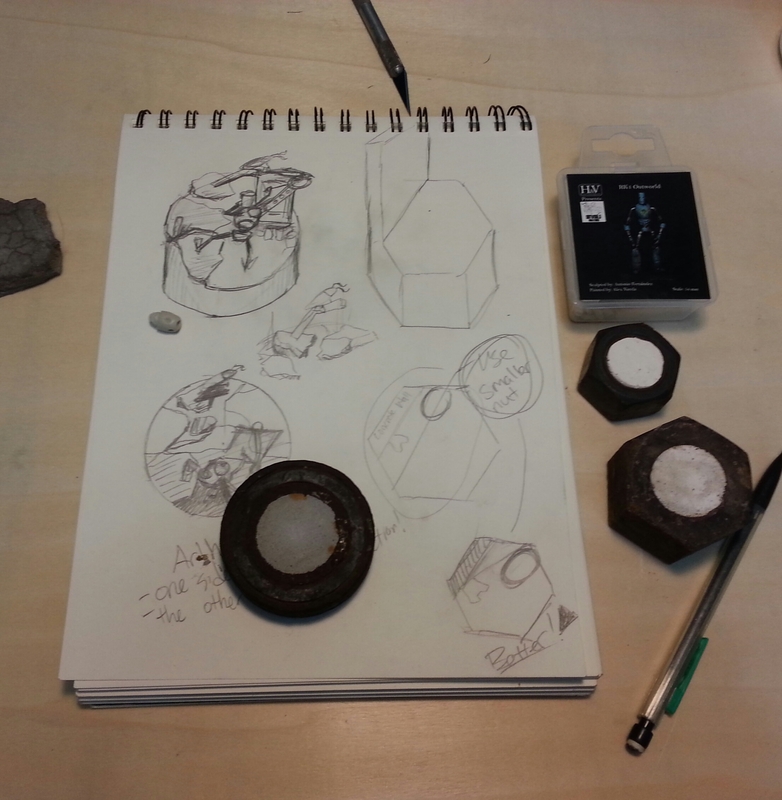 Preliminary Sketches are vital when dealing with a complex project. Under the baking sun the mud dries and cracks in harsh lines. 4) The RK1 robot kit has many options. I chose to stay close to human in design because I wanted my audience to easily relate to him. Also, art is a very human trait and I felt my robot should reflect this. I imagined him living in a post-human world where humanity has attempted to preserve their minds from the ravages of a dying world. 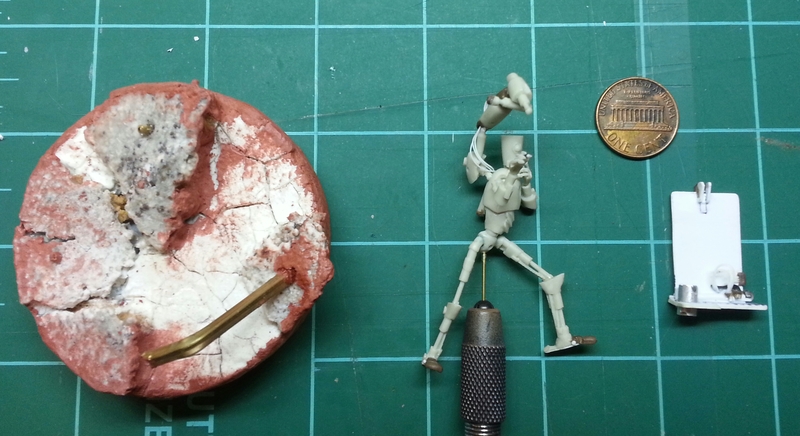 The various parts are chosen and carefully cleaned. 5) Since I wanted to convey complex mood and emotion, I knew that the correct posing of the hands would be critical. So I had my wife take photos for me to use as reference. I highly recommend this when approaching difficult subjects. 6) The pose for Arthur’s Left hand and arm was created in three steps. The order of operations was vital to getting the hands posed correctly. Referencing the photos, I formed the fingers to the general shape using a little heat from my hair dryer. 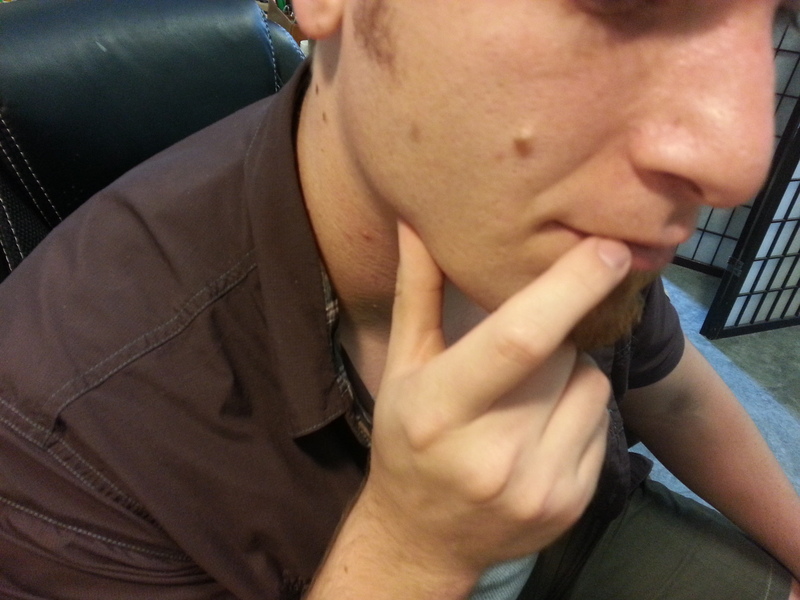 Then, I attached the hand to the face with small amounts of super glue. Only then was the arm pose set. 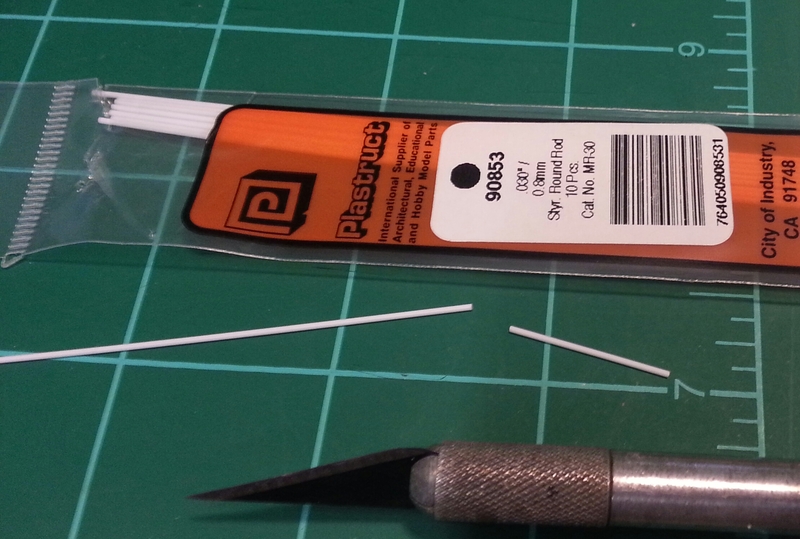 A pair of locking tweezers are really useful when working with tiny parts. 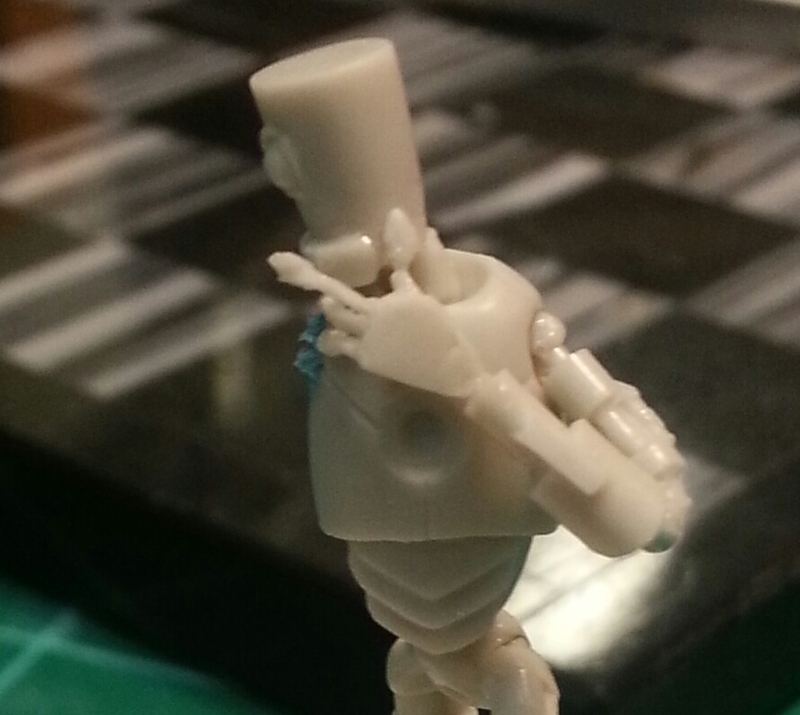 The hand is only tacked into place. For best results us a thin non-gel super glue. The positioning of the arm comes last. 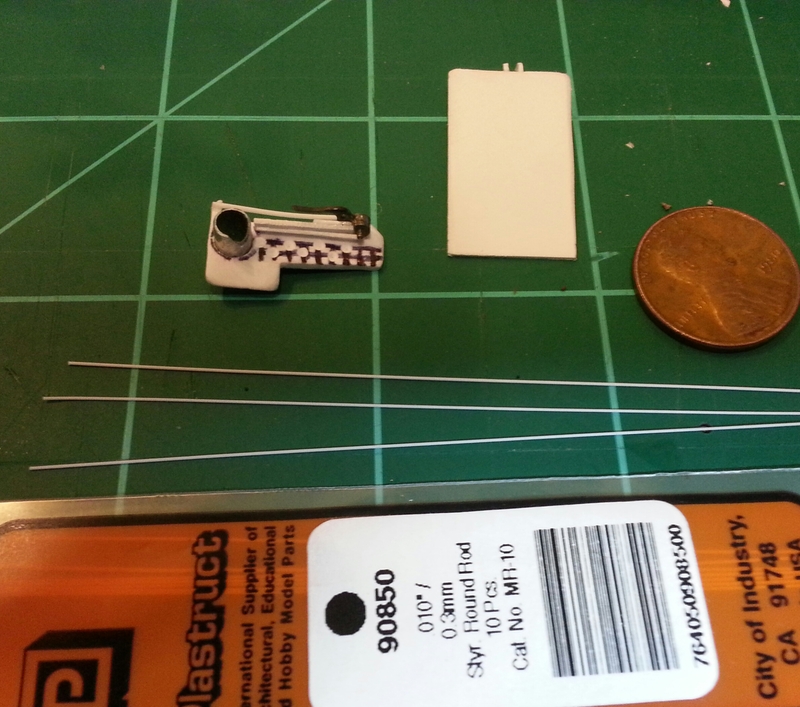 7 a,b) I used several thicknesses of plastic rod for this piece. 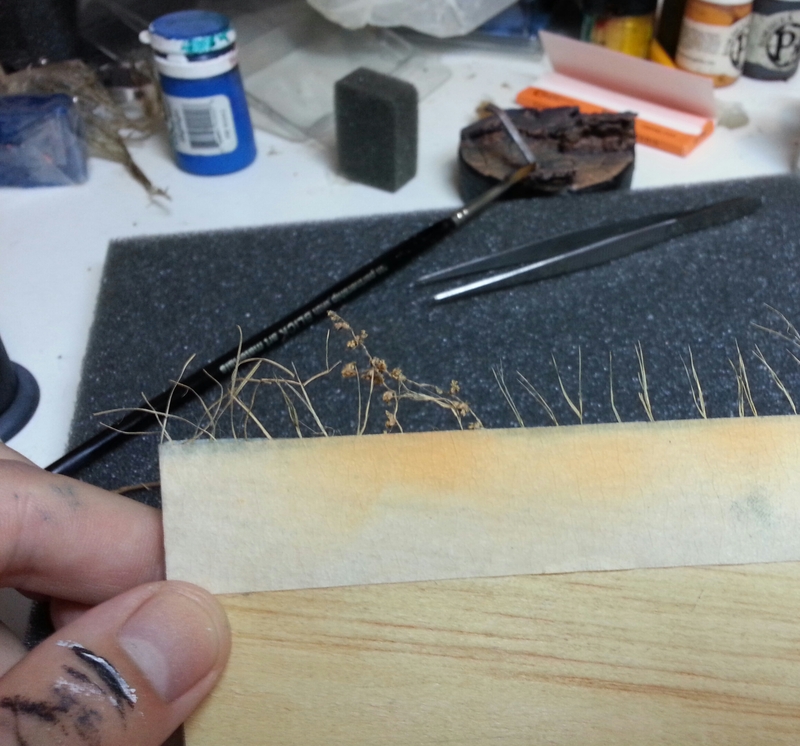 It’s a cheap and useful material to have on-hand as the properties are quite different from metal wire (which you will see in the next few steps). 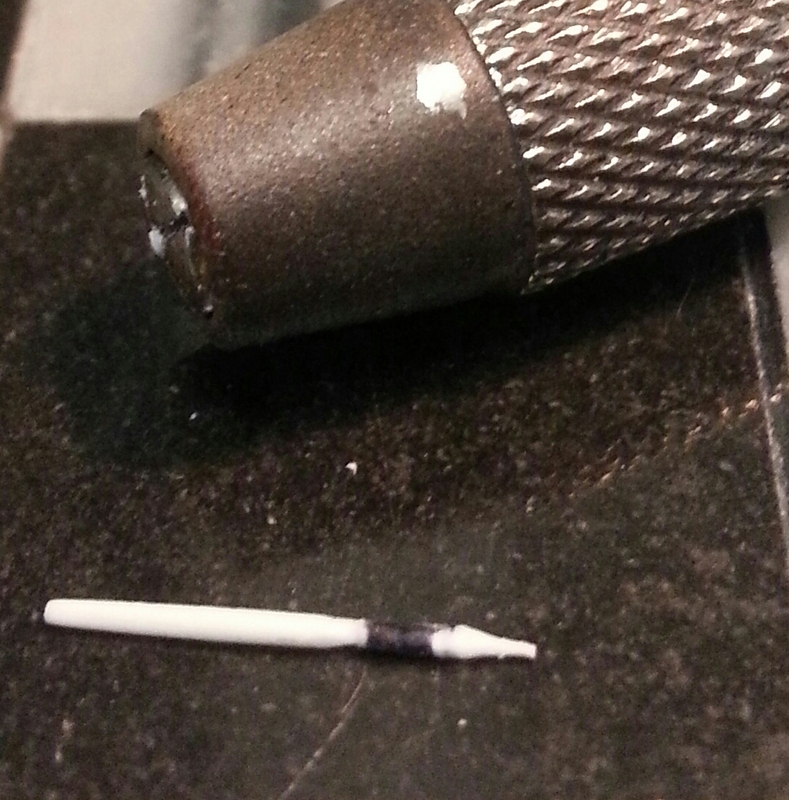 This length of 0.8mm plastic rod was gripped in my pin vice and shaped with diamond files. 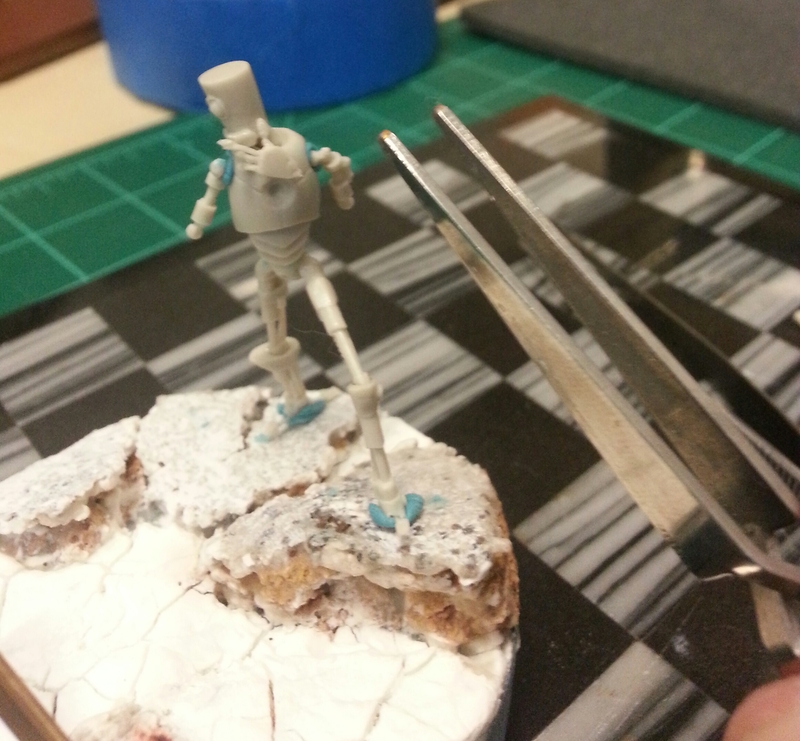 9) Referencing the photos, I glued the brush into its place, resting against the robot’s pointer finger. 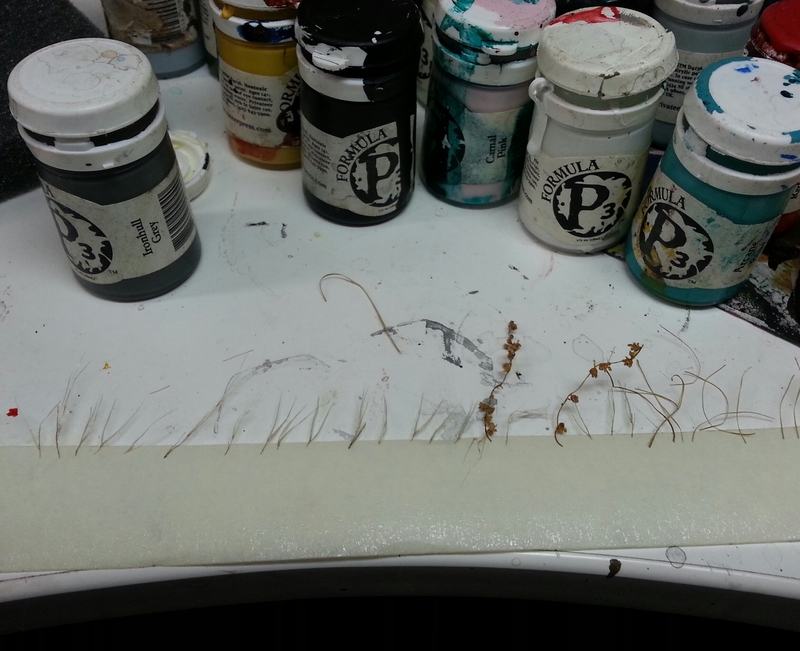 Then I used a hair dryer again to form the fingers into position around the brush. It is too early to add the right arm since the distance to the easel is still unknown, so the hand is set aside for now. 10) The joint between the robotic arm and the easel is made up of the easel backing, a spacer, and two sides with depressions that I created using a small drill. 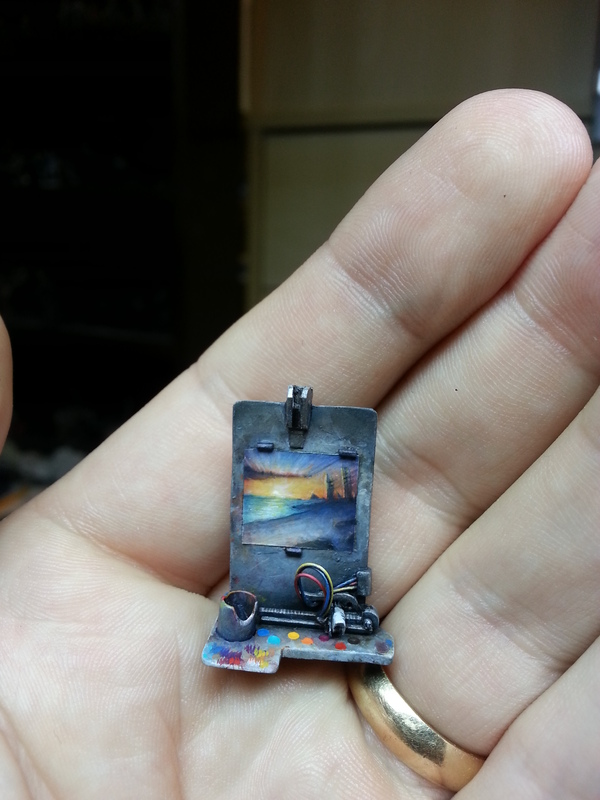 With the parts assembled, the joint hung freely and the painting easel could be removed from/re-attached to the robot arm throughout the painting process. 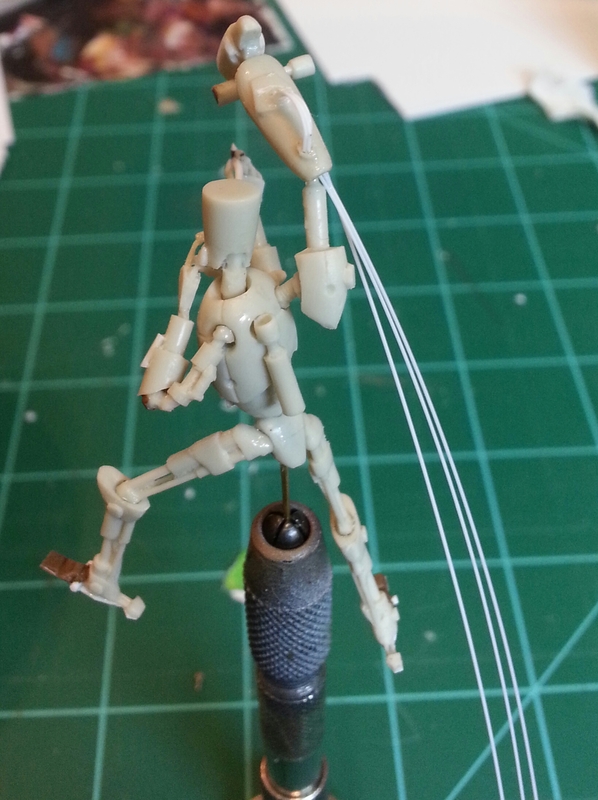 11) The pose for the robotic arm was worked out one joint at a time through careful dry fitting. 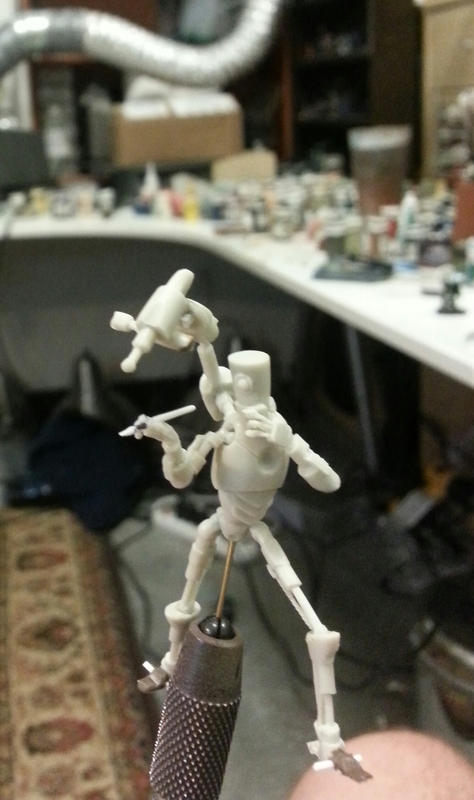 With the distance to the easel set we can proceed with setting the pose of the right arm. 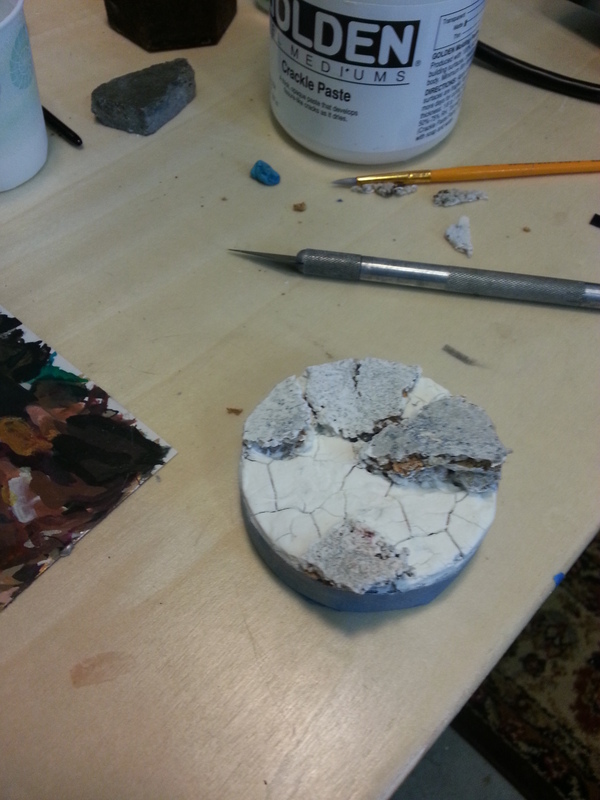 12) The modifications of the palette into a robotic paint dispenser and palette begin! 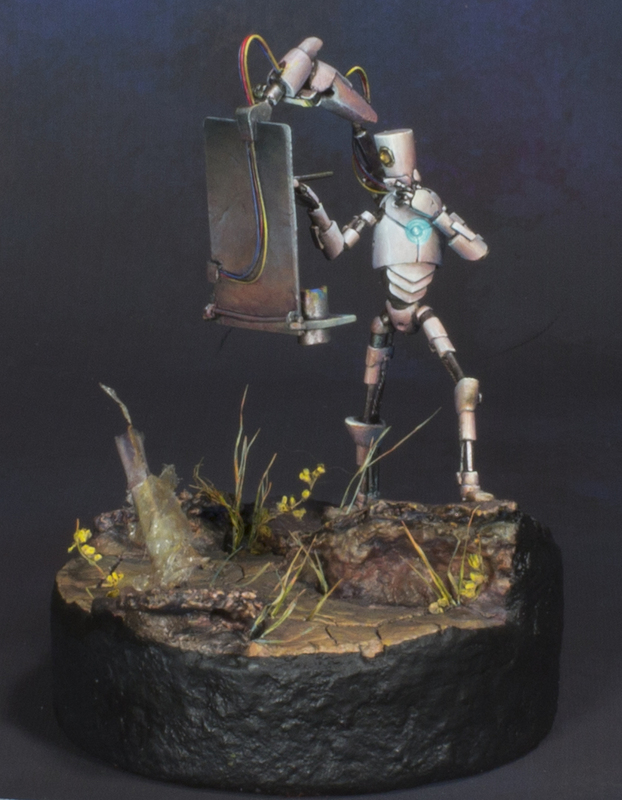 The idea behind the design is that Arthur has a robotic paint dispensing palette. The primary colors are fed into a device that mixes his colors for him. 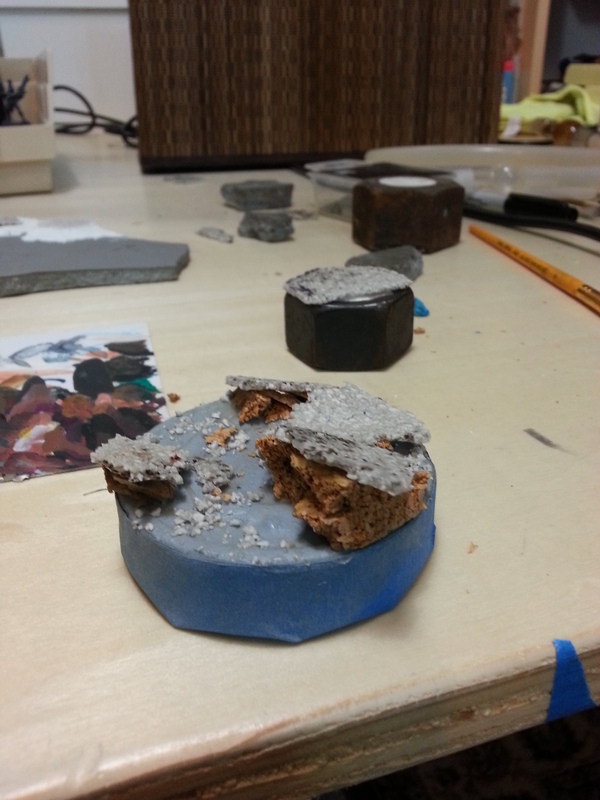 A small dispenser runs along a track depositing mixed paint onto his palette. Perhaps a little strange to us but perfectly normal for a robot. 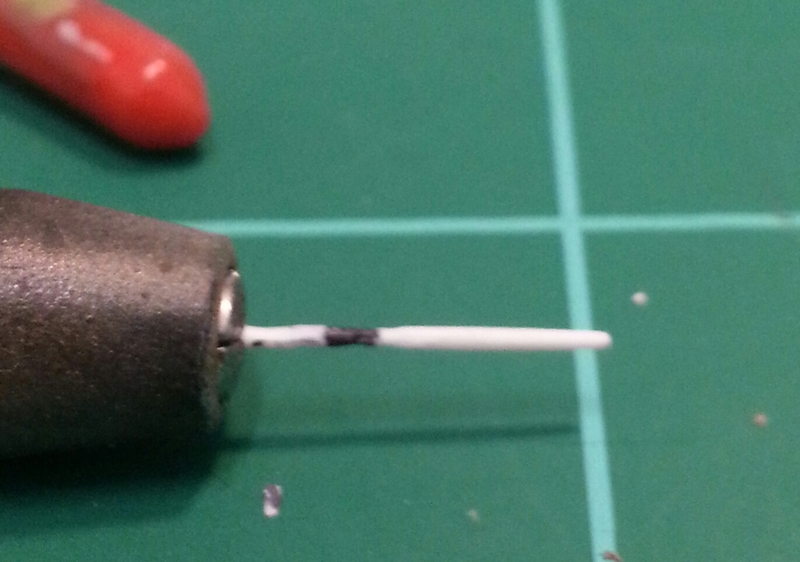 For the paint feed lines, plastic rod was used instead of metal wire. This plastic finds its own shape, yielding a result that is (in this case) more natural and also more durable. 17) Back to work with some serious Painting-Mojo coursing through my veins! Precision scissors were used to the dissect grasses. 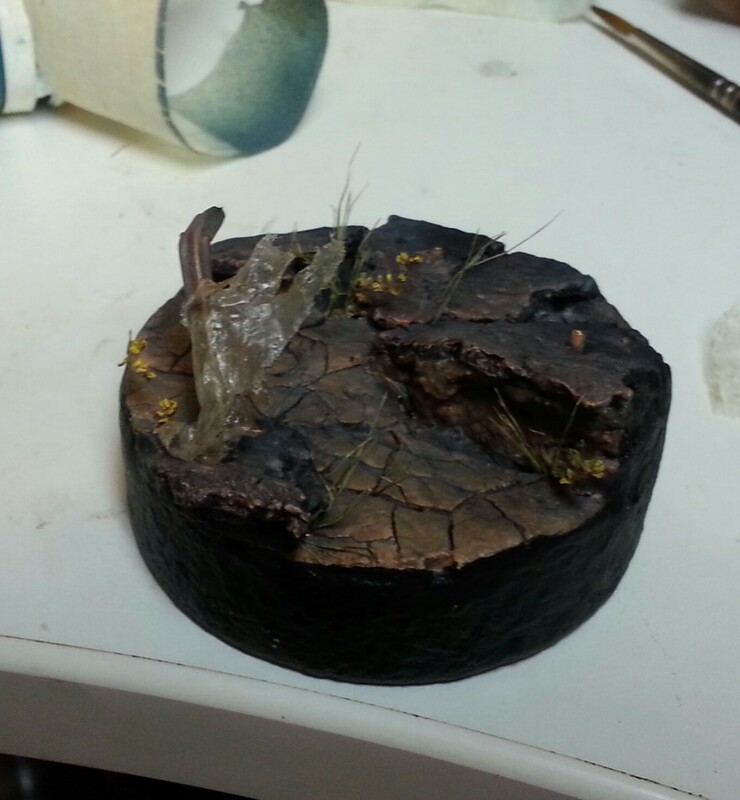 Next, the grass pieces are stuck to tape and affixed to a block. 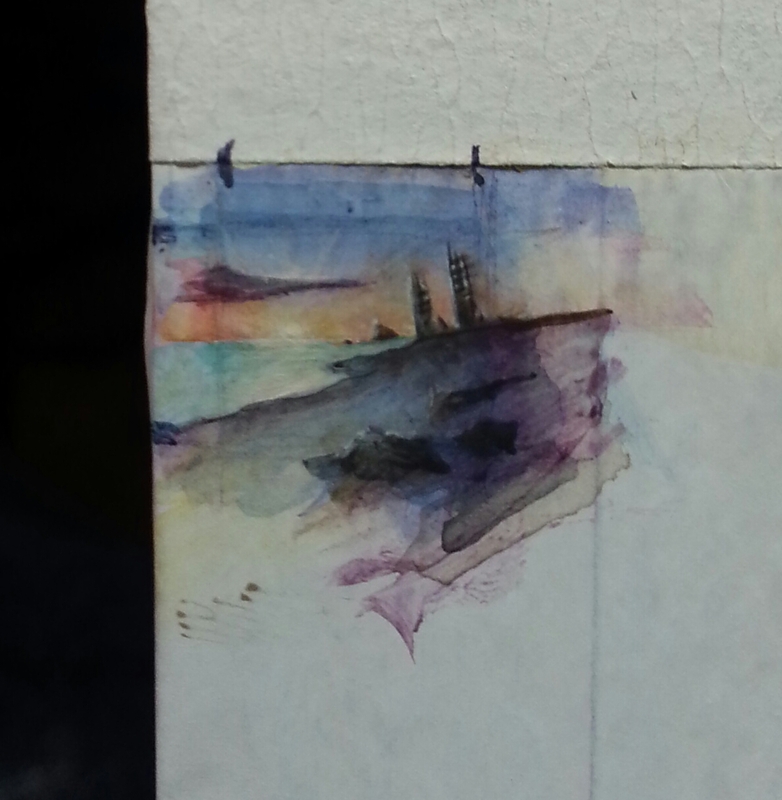 Then I airbrushed one side orange and the other side blue to simulate the light of sunset. I saved the tiny painting until the end. Honestly, I had never done anything like this before. 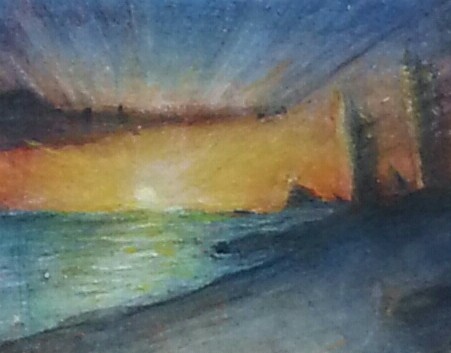 I did not know how long it would take, if I would be unable to complete the painting, or if it would be so badly done that all of my previous work would be wasted. I only had one day left to finish the painting and final assembly, so after a hearty breakfast with a big cup of powerful coffee, I attacked the project with all I had! 22) The painting was painted on a cigarette rolling paper. 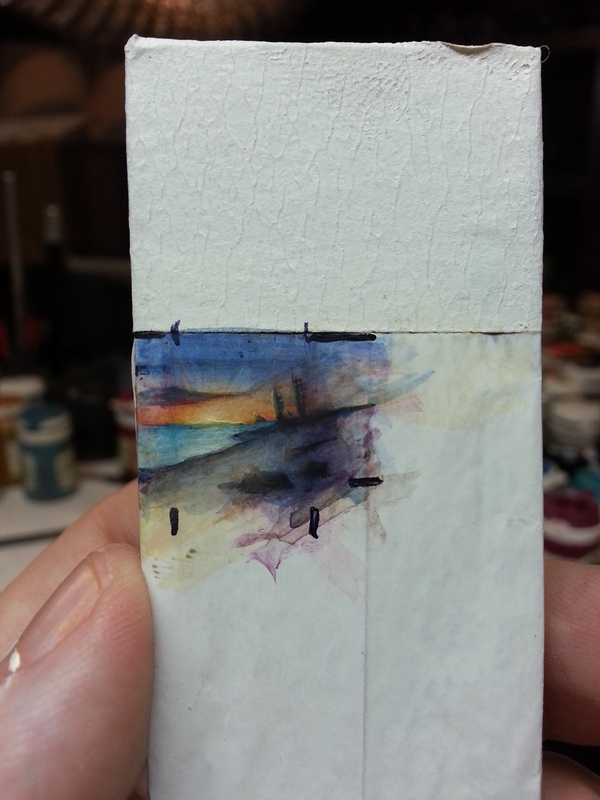 Other papers are too thick for miniatures and will be out of scale with the model. 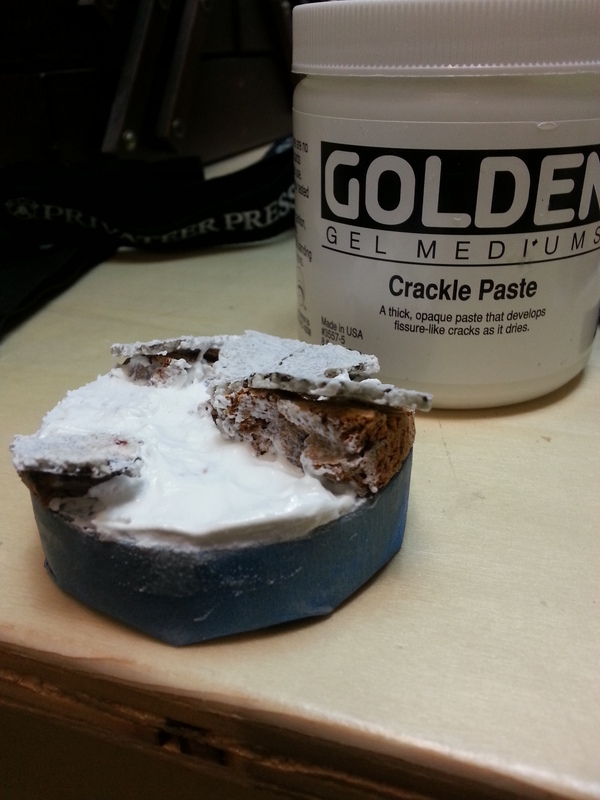 The paper was taped to a plastic block and primed with white primer. The dark lines were my planned cropping lines. It’s good to be able to crop for added flexibility. 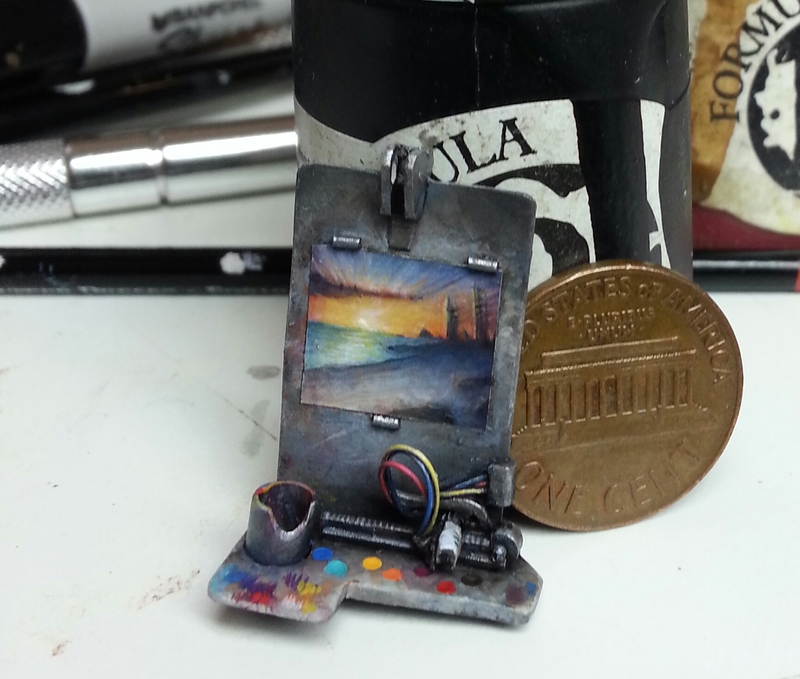 23) Here are some pictures of the painting and palette before assembly so you can get an idea of scale. 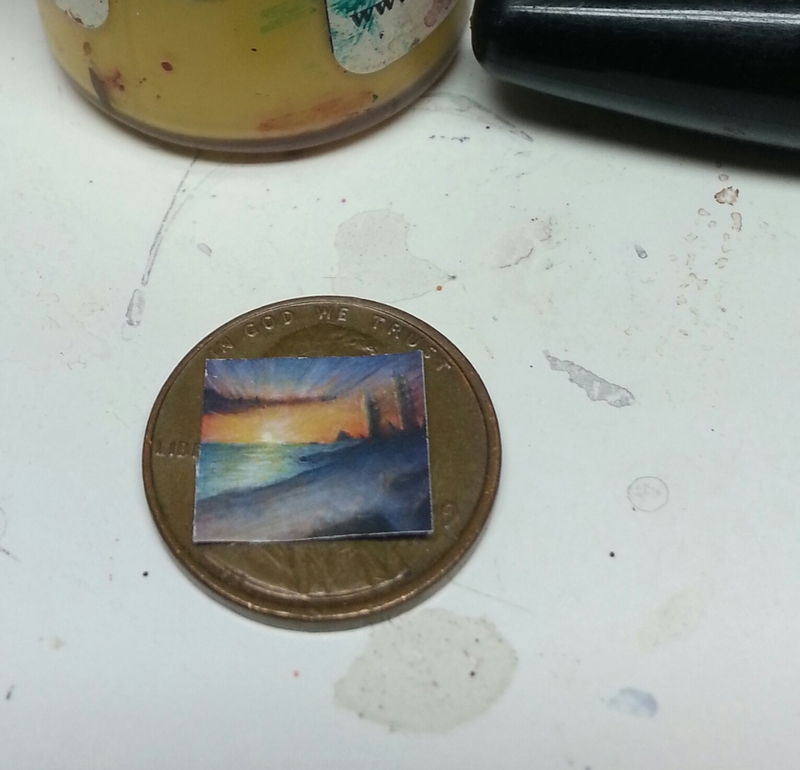 The coin pictured (US penny) is the same size as a two-cent Euro coin. 24 )A big thank you to Massive Voodoo for asking me to write this project log, and a special thanks to all of you for following along! 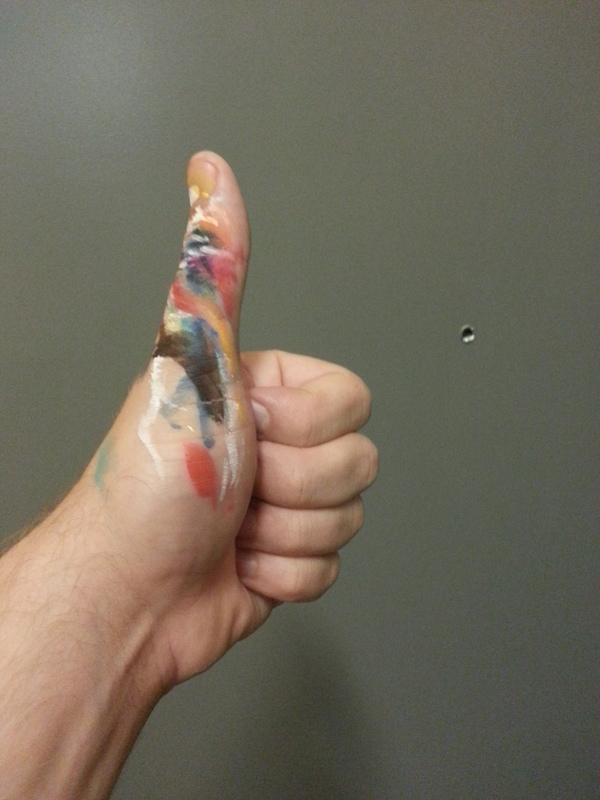 I hope you find your inspiration and enjoy many hours, days, and years of happy painting.